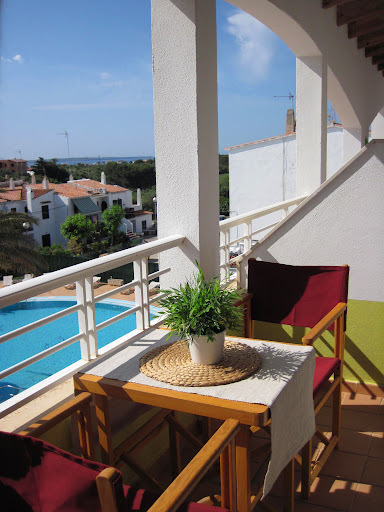 Top floor one bedroom apartment on the west coast of Menorca. Located in the quiet area of Cala’n Blanes which is only 100 metres from the beach and conveniently close to the city of Ciutadella. An open-plan air-conditioned living room with double sofa bed, coffee table, flat screen TV and wireless broadband. Air-conditioned bedroom with king size bed and very spacious built in wardrobes and drawers. Open-plan kitchen well equipped with electric cooker, toaster, microwave, fridge, freezer, kettle, coffee maker, pots/pans, containers, plates, cups and cutlery. One bathroom with shower. Balcony off the living room with excellent sea views, there is a table and chairs if you fancy eating ‘al fresco’. Community swimming pool and gardens. This entry was posted in Menorca by admin. Bookmark the permalink.